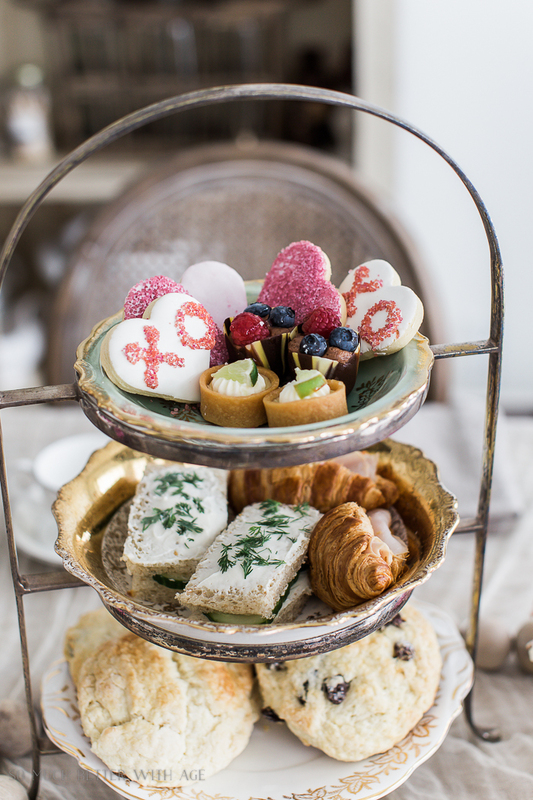 Valentine’s Day is coming up and what a better way to celebrate it than with a high tea party. I LOVE high tea! There was a time just before I had kids where I would go to for high tea place almost every month with girlfriends. 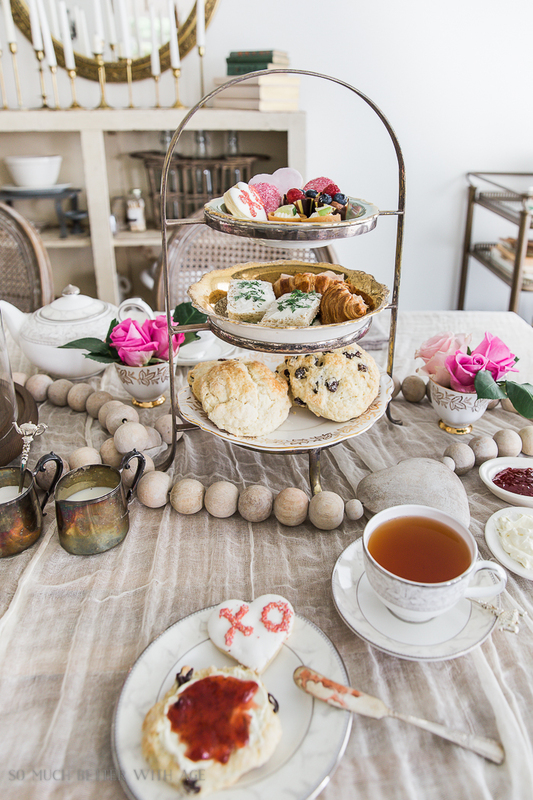 It’s the most perfect way to catch up with friends while drinking tea and eating scones with pretty china. 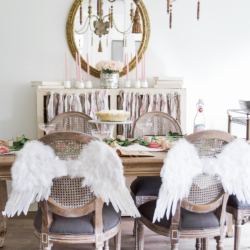 Today I’m taking part in another Styled + Set entertaining tour hosted by my friend Lory of Designthusiasm. If you are coming here from Kelly’s house of My Soulful Home, welcome! Be sure to visit the other tours at the end of this post. My boyfriend Aaron loves high tea too and over the Christmas holidays we had a three-day mini vacation to Victoria and stayed at the Empress Hotel and had high tea there. The hotel is one of the oldest hotels in the city right next to the Parliament buildings and is famous for their high tea. First I set my table with this tablecloth I made. The tutorial for this tablecloth is in my book, French Vintage Decor. I set the table with tea cups and saucers, side plates, bread knives and teapots. Usually each person has their own teapot but I have two teapots so I made two different types of tea. My favorite type of tea is a loose leaf creamy earl grey tea so I made that in one pot and the other tea can be any other tea you think your guests will like. Keep boiling water in the kettle to refresh the teapots. 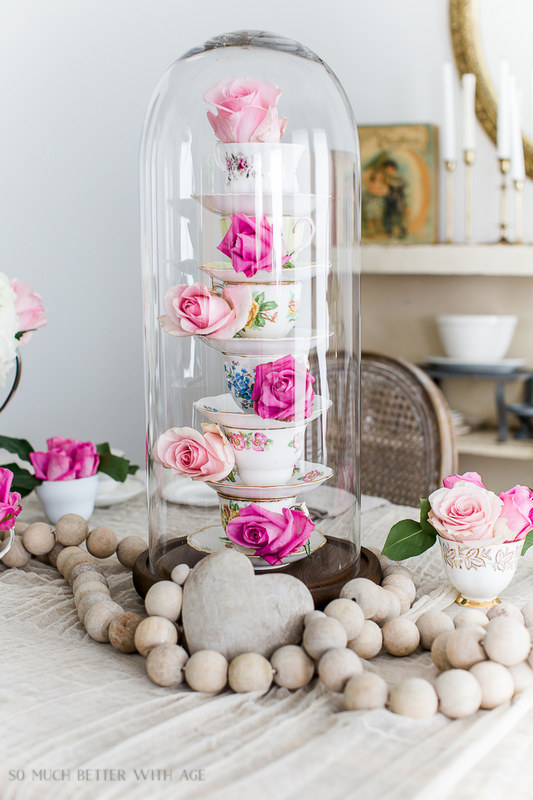 This centrepiece I made using a tall cloche, six teacups and saucers and some roses. I love how it turned out! I just recently bought this French glass cloche from Restoration Hardware. Don’t let the size fool you, it’s a small on the website! I draped large prayer beads lengthwise along the middle of the table and put the centrepiece, vase of flowers and tiered tray in between the beads. I have a large collection of teacups so I also cut some roses and added them to some teacups for some mini bouquets. There is usually one tiered tray for 2-3 people and each person gets one scone and usually one or two of everything else. It’s nice to have an assortment of sugars on hand and honey along with milk served in pretty containers. The best way to eat your scone is to cut it in half and spread the clotted cream on first then strawberry (or similar) jam on top. There is nothing better! Usually I am so full at this point that I can’t make it to the next tier. High tea is deceiving. Come hungry and make your reservation for 12 noon for lunch! 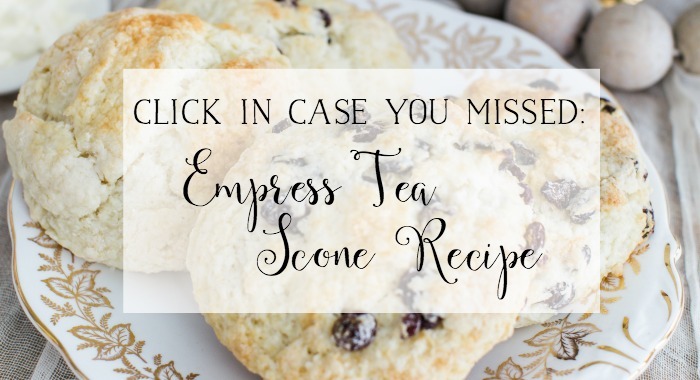 Be sure to print off the Empress Hotel tea scone recipe here! Now be sure to visit Jennifer from Celebrating Everyday Life. Oh my goodness, Jamie, this is just gorgeous! I’m a huge teacup fan and collect them as well. I’m also an earl grey lover… 🙂 Love love love this table!! Thank you so much, Lory!! 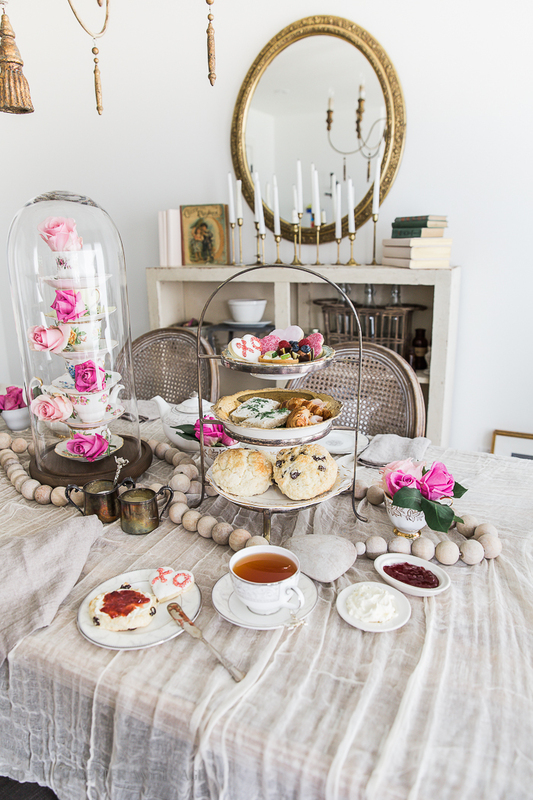 Having my favorite tea and scones, and then tea cups and roses, what a cute center piece. Just right for a pretty Tea. Isn’t it the best? I love it too! Thank you, Marlene. I love that show! Thank you so much, Donna. Wonderful post babe! I do love high tea with you. Oh Jamie, everything is just perfection. 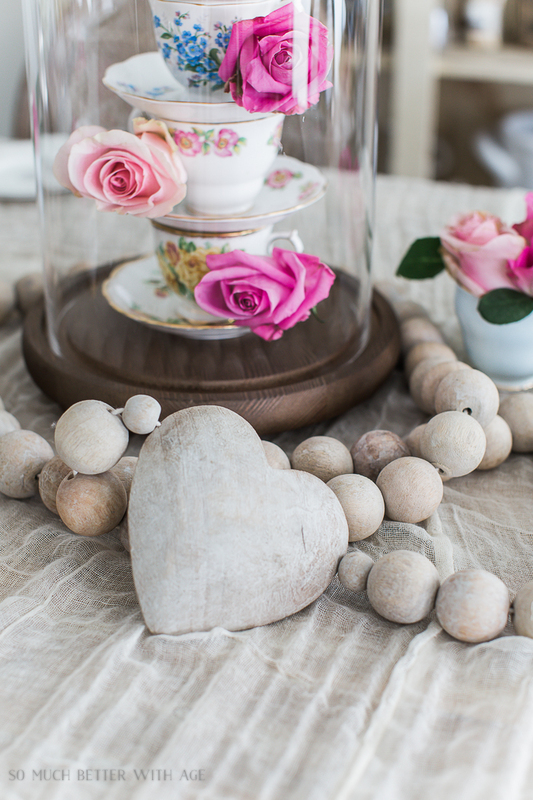 The teacup tower, the wooden beads, that ethereal tablecloth… I’m totally in love! Thank you so much, friend! Come over for tea! My, your cloche is SO BIG! 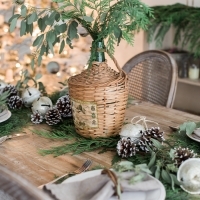 Love it Jamie & the way you styled it and the table is fabulous! Loved seeing the photo of you and Aaron too! Pinned and noted the high tea suggestions. Yum! I still swoon every time I see your chandelier. You set such a pretty table beneath it. Love the tablecloth! You’re so sweet. Thank you, Shelly! Jamie this is soooo cute! Like you, I love high tea and also used to go frequently with girlfriends (no more of that, that’s for sure!) But I love the idea of doing it at home. And your centerpiece is so beautiful! I love the vintage china and as always, your style is perfection! Thanks so much, Sheila! High tea is the best with girlfriends! 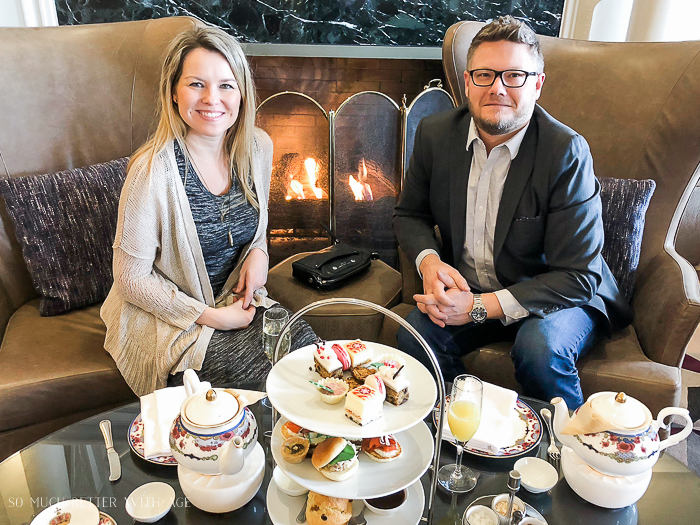 I too have been fortunate to enjoy tea at the Empress – it is the ultimate experience! It was a chilly November day when I was there and we managed to get the table right in front of the fireplace…DELISH! 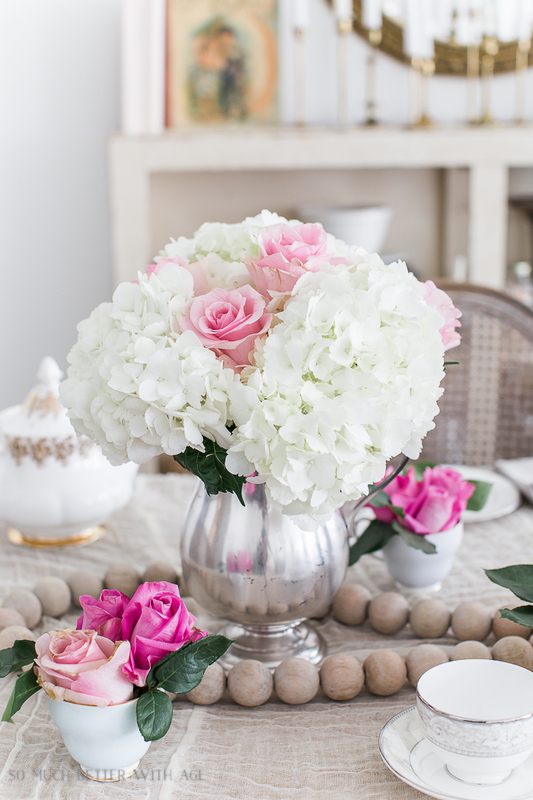 Your high tea is beautiful – love the centerpiece idea! And the tablecloth is perfect, so light and evocative of the setting. i’m going to download the recipe for sure. Oh and by the way Jamie, my prize package arrived today and I can hardly wait to get going on some projects! Thank you so much. Here’s to a great cuppa! Thank you, Wendi! I’m so glad your package arrived in one piece. 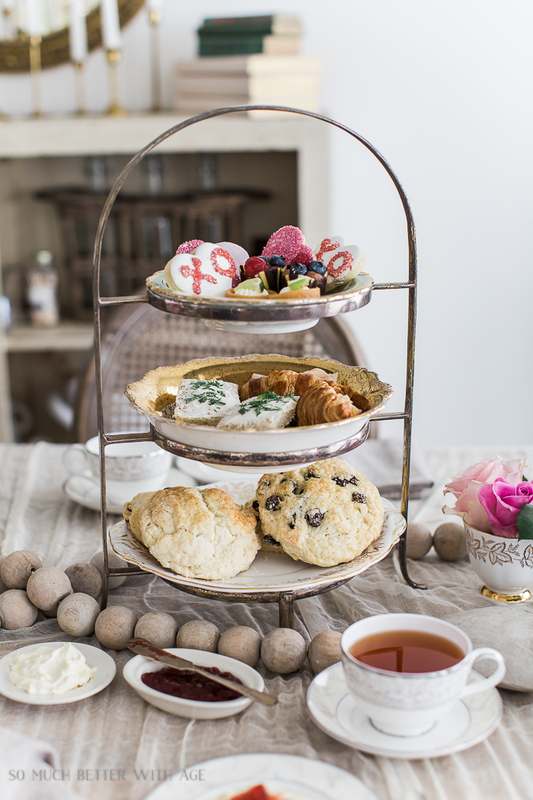 I love a good tea party and have been interested in what to serve since I first had afternoon tea at Elmwood Inn in Harrodsburg, Ky. They no longer serve tea but hold classes to educate people on the variety of teas. I did want to mention that there is a difference between High Tea and Low Tea or Afternoon Tea which is lighter than the previous. High Tea was historically served after 5:00 pm and served as the meal. You can read more about it at https://www.thespruce.com/high-tea-vs-afternoon-tea-765832. Keep having fun! Thanks so much for that information, Harriet! Beautiful table? Great tea party tips too. 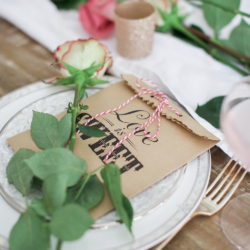 Love that centerpiece…. I am certain I would have knocked it over! Earl grey is one of my favorites! Yum! haha Angelina! You wouldn’t have knocked it over 😉 Thank you! This is far far the most amazing tea party I have ever seen…this is real right? Good job and thanks for bringing this to us in beautiful pictures. Just wondering how much would it take in effort and thought to make this happen. Thanks, Mel! Yes it’s real lol. And it was delicious! I saw photos of you setting this up and the lighting was going!! What a beautiful display! 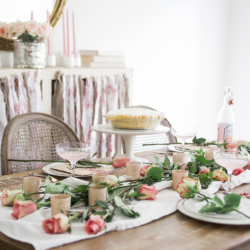 I hosted a tea party baby shower last year and I want to have one when I host Bunco this year. But oh such fun to have a few friends over for a small tea close to Valentines Day! I love ❤️ the RH cloche as it’s perfect for the teacups. I like the roses tucked around too. How fun!! Thanks so much, Gwen! It was so much fun to set up…and eat! Really pretty! I have an 8 year old who’d be playing the tea party part, she’d love it so much. 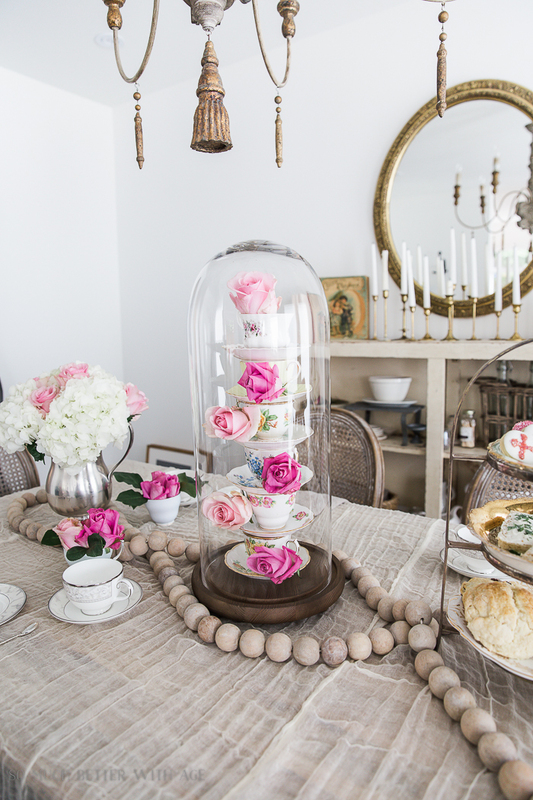 The stacked tea cup cloche is a great idea! Visiting from BFF party. This is so gorgeous! I am so happy you linked up to the Spring Tea Party Link Up! Have a great weekend! Thank you so much, Amber! I enjoyed your tea party. What a sweet little tea party. 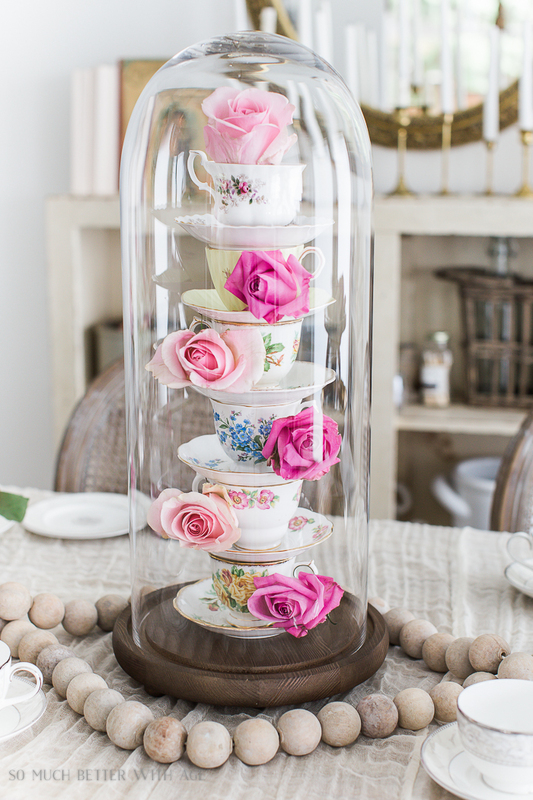 Teacups and roses are my favourite… add in a cloche as well and my heart is swooning. Totally adore this Valentines High Tea Jamie. Thank you for sharing it at Create, Bake, Grow & Gather this week. 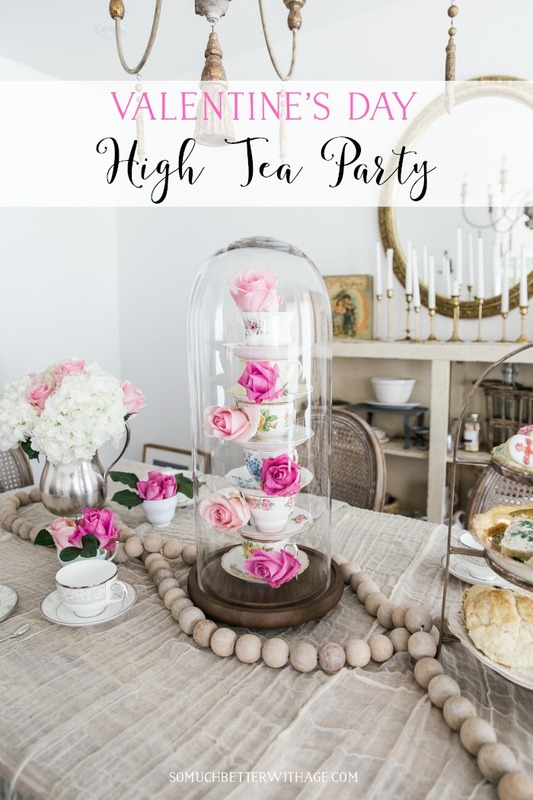 I’m delighted to be featuring your High Tea at tomorrow’s party and pinning too. Thank you so much, Kerryanne! 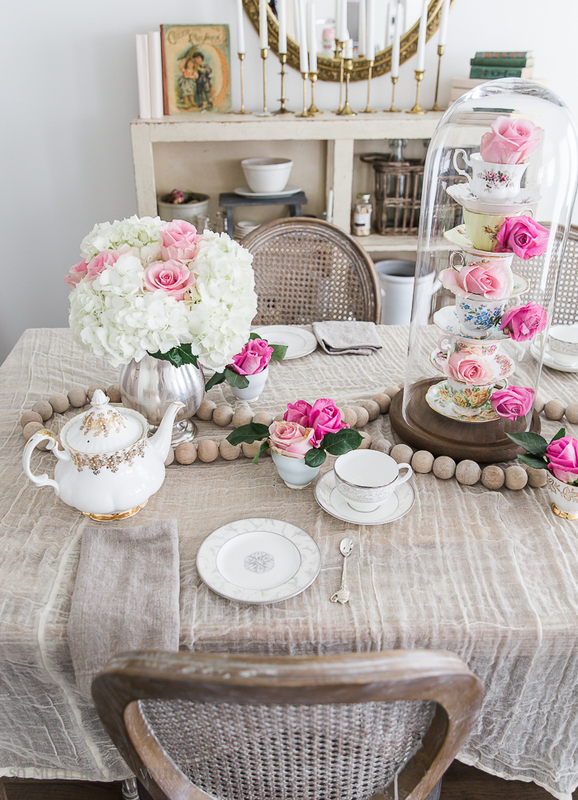 This high tea party was so much fun to put together. Hi Jamie! Love your tablesetting and I know I saw your post recently and thought I had left a comment but I guess I didn’t get back by ~ so happy that you posted it to Share Your Style #194 this last week!!! Now I get to come over for sure. <3 Love the cloche tower of teacups ~ so ethereal! Thank you so much, Barb! 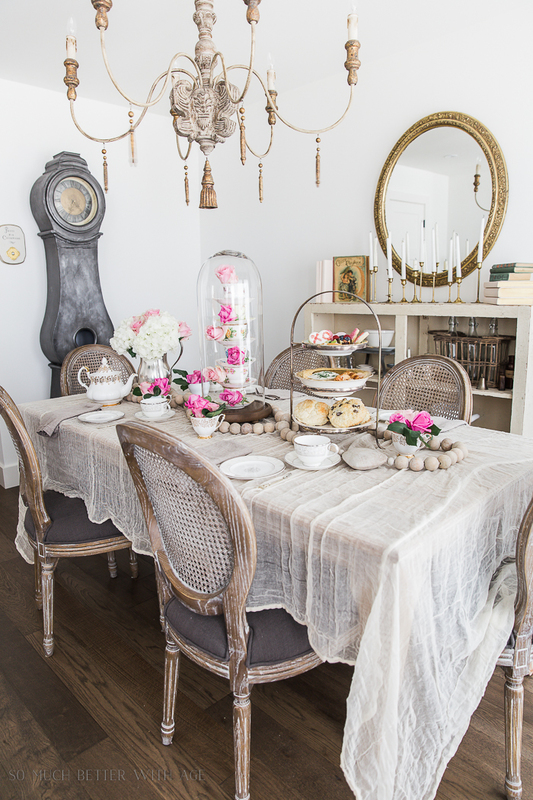 This high tea party was so much fun to put together. Thank you so much, Julie! It was so much fun to put together and I’m craving a scone now.